For a state with the moniker, Fountain of Knowledge, the match-up of the intellectually gravitating Dr. Kayode Fayemi and the grassroots mobiliser and lawyer, Rep. Opeyemi Bamidele should have been in the realm of the academia. Before his advent into the political terrain, Governor Fayemi had distinguished himself in civil rights advocacy within and outside the continent. His wife, Erelu Bisi Fayemi was also, no less a successful activist in Africa. Mutual friends of Fayemi and Bamidele say that the relationship between the two was itself, also tied to Bisi, who before marriage formed a convival bond with the two men before a more permanent marital bond with Kayode was created. The friends also say that Fayemi ascension to the governorship of Ekiti State was greatly facilitated by Bamidele who at the time of the nomination for the 2007 gubernatorial contest, was an integral factor in the Bola Tinubu political machine in Lagos. But how the duo of Fayemi and Bamidele fell out remains a matter of conjecture which both men have so far refused to divulge. Suggestions that Fayemi has taken his advocacy to the Ekiti landscape is, however, not in doubt given his landmark projects all around the state. Roads, abandoned tourist locations and social welfare policies adopted by the governor indeed have raised the stakes. But not everyone in the state that is littered with eggheads is satisfied with what Fayemi has done or his style on ground. Bamidele who was elected to the House of Representatives after stepping down from the Senate contest that was bestirred by much rancour has been at the head of the criticisms. Even more than the major opposition party, the Peoples Democratic Party, PDP Bamidele as a member of the then Action Congress of Nigeria, ACN was at the vanguard of the crusade against what he claimed the underachievement of the Fayemi administration. That was the beginning of what many saw as a titanic battle. However, what many supposed would be a battle of brains between the two, inevitably turned bloody when Bamidele formally made a declaration to contest the gubernatorial election against Fayemi early last month. Foluso Ogundare one of Bamidele's supporters was shot dead while another supporter, Madam Beatrice Ige survived to tell her story. 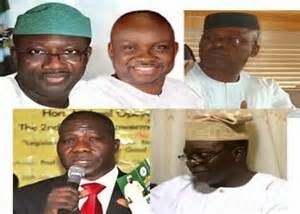 That was not the first physical skirmish that Bamidele would suffer and blame Governor Fayemi for. Last April he was attacked in Igede Ekiti on Friday, 12th April, 2013 during a mobilization visit to the area. Given the inclination of the political establishment towards a second term for the incumbent governor, it was not lost on Bamidele, his associates and observers that the APC would not accommodate his aspiration. It was therefore not surprising that the legislator last Sunday revealed that he would be joining the Labour Party. The decision may have come as a surprise to many, but definitely not to many leaders of the APC who had been predicting the move. "Must we continue to wrestle for justice within the same boat where injustice has become institutionalized by those who, in spite of what they preach, have consistently demonstrated extreme allergy to internal democracy? Clearly, our answer is NO." His declaration for Labour Party is, however, bound to elicit strong reaction from the political establishment, especially his political leader, Asiwaju Bola Ahmed Tinubu. It is even believed to be more provoking, given the choice of Labour Party, which Governor Segun Mimiko of Ondo State is said to be using to undermine the APC in the Southwest. Mimiko was re-elected last year for a second term after a bruising challenge from the APC spearheaded by Tinubu. Following his success and the alleged alliance between Mimiko and the PDP administration at the centre, it was claimed that Mimiko had become the linchpin to be used against Tinubu's hold on the Southwest. Ekiti and Osun which hold gubernatorial elections next year, it is assumed, are to be the test grounds for Mimiko's outreach. By teaming up with Tinubu's arch foe in the Southwest, Bamidele who served as special adviser and commissioner in Lagos State for twelve years under the patronage of Tinubu may have broken the cord between the two men.His exit from the APC has nevertheless been welcomed by the party in the state which obviously must have been relieved. "Opeyemi Bamidele's declaration of his governorship ambition today in Emure and on the platform of Labour Party is a welcome development. This is democracy and it is about free entry, free exit." "Why declaring at Emure at a time the dead is still being mourned in the town? Our people can see how he is now dancing on the death of our citizen in Ekiti. "Governor Kayode Fayemi had to postpone his trip to Emure in reverence of the dead. Why can't Opeyemi allow the dead - victim of a recent violence in the town- to be buried before going there to play politics? This confirms our position that he actually masterminded the crisis and fatality in the town for his selfish interest." "More so, since his ambition was concocted in Akure and his supporters are there, would it not have been better he declared there?" That indeed is an indication of the interesting time for stakeholders and observers ahead of the promising gubernatorial contest in Ekiti State.